Victoria Greet BVM&S, PGDipVCP, MRCVS. Victoria graduated from the University of Edinburgh in 2014. Following this, she achieved a position on the competitive PDSA Graduate Programme and rotated around three busy London charity hospitals with both a high medical and surgical case-load. 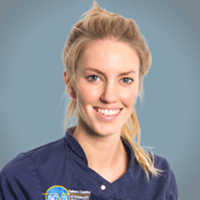 She stayed with PDSA for a further year as a full-time veterinary surgeon after which gained a place at the Royal Veterinary College on their rotating small animal internship programme. During this time, she completed her postgraduate diploma in veterinary clinical practice and became involved in a research project focussing on feline arrhythmias. She has undertaken several specialist externships in cardiology in both the UK and America and is very keen to pursue a career as a specialist in cardiology.